There’s too many people, so you have to split up into groups to cook the different menu items. You only really get hands-on experience with 1 dish, and just get to observe the others being made. There’s a wide variety of skill levels. There’s nothing more frustrating than being in a cooking class with someone who is still learning how to cut an onion with a Chef’s knife. Take the knife skills class first, then come learn some recipes. You usually only like 1 or 2 things on the menu. The pre-set menu is extremely limiting, and at the end of the day you have a bunch of recipes you might not care about. Obviously, there’s an easy way to fix all of these things: take a private cooking class. However, that’s usually cost-prohibitive in a place like Atlanta. Not so in Bangkok – you can find a completely customized experience for an extremely affordable price. And that’s exactly what we had with our teacher Angsana Anderson of Thai Home Cooking. 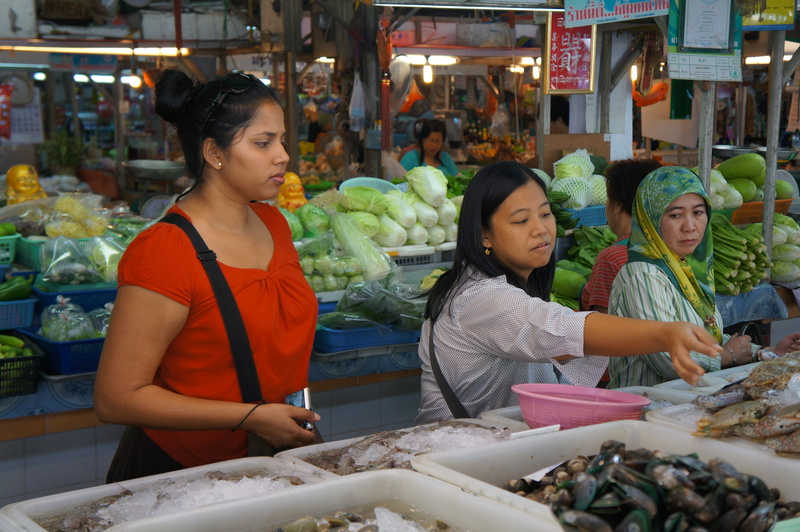 One of the most unique aspects of this class was that our day started with a trip to the market, where we told Angsana the 3 dishes we had decided we wanted to make (no pre-set menu!). We went to the On Nut market in a busy residential area of the city. For a small open-air market, it had the most incredible variety of food. This was a true farm-to-table experience, as we watched vendors butcher pigs that had been slaughtered that morning. It doesn’t get fresher than this. No Perdue processed chicken or frozen mystery meats here. We felt like we were truly being immersed into Thai life, experiencing how the locals shop. I’ll leave this post with just a set of pictures from the market to give you an idea of the vibe there, and I’ll follow-up with another post about how we turned the ingredients into 3 mouth-watering (and sweat-inducing) dishes! Thanks for the clarification on the turtles! That looks amazing! I’d love to do something like that one day. I hope you learned a lot that you can share with us. And bring me back one of them baby turtles :).